Scanning electron micrograph of Listeria monocytogenes. Listeria monocytogenes is the species of pathogenic bacteria that causes the infection listeriosis. It is a facultative anaerobic bacterium, capable of surviving in the presence or absence of oxygen. It can grow and reproduce inside the host's cells and is one of the most virulent foodborne pathogens, with 20 to 30% of food borne listeriosis infections in high-risk individuals may be fatal. Responsible for an estimated 1,600 illnesses and 260 deaths in the United States (U.S.) annually, listeriosis ranks third in total number of deaths among food borne bacterial pathogens, with fatality rates exceeding even Salmonella and Clostridium botulinum. In the European Union listeriosis follows an upward trend that began in 2008, causing 2,161 confirmed cases and 210 reported deaths in 2014, 16% more than in 2013. Listeriosis mortality rates are also in the EU higher than for other food-borne pathogens. Listeria monocytogenes is a Gram-positive bacterium, in the division Firmicutes, named after Joseph Lister. Its ability to grow at temperatures as low as 0 °C permits multiplication at typical refrigeration temperatures, greatly increasing its ability to evade control in human foodstuffs. Motile via flagella at 30 °C and below, but usually not at 37 °C, L. monocytogenes can instead move within eukaryotic cells by explosive polymerization of actin filaments (known as comet tails or actin rockets). Studies suggest up to 10% of human gastrointestinal tracts may be colonized by Listeria monocytogenes. Nevertheless, clinical diseases due to Listeria monocytogenes are more frequently recognized by veterinarians, especially as meningoencephalitis in ruminants. See: listeriosis in animals. Due to its frequent pathogenicity, causing meningitis in newborns (acquired transvaginally), pregnant mothers are often advised not to eat soft cheeses such as Brie, Camembert, feta, and queso blanco fresco, which may be contaminated with and permit growth of Listeria monocytogenes. It is the third-most-common cause of meningitis in newborns. Listeria monocytogenes can infect the brain, spinal cord membranes and/or the bloodstream of the host through the ingestion of contaminated food such as unpasteurized dairy or raw foods. 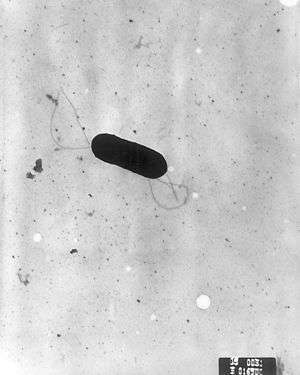 Listeria monocytogenes is a Gram-positive, non spore-forming, motile, facultatively anaerobic, rod-shaped bacterium. It is catalase-positive and oxidase-negative, and expresses a beta hemolysin, which causes destruction of red blood cells. This bacterium exhibits characteristic tumbling motility when viewed with light microscopy. Although L. monocytogenes is actively motile by means of peritrichous flagella at room temperature (20−25 °C), the organism does not synthesize flagella at body temperatures (37 °C). The genus Listeria belongs to the class Bacilli and the order Bacillales, which also includes Bacillus and Staphylococcus. The genus Listeria currently contains 10 species: L. fleischmannii, L. grayi, L. innocua, L. ivanovii, L. marthii, L. monocytogenes, L. rocourtiae, L. seeligeri, L. weihenstephanensis and L. welshimeri. L. denitrificans, previously thought to be part of the Listeria genus, was reclassified into the new genus Jonesia. Both L. ivanovii and L. monocytogenes are pathogenic in mice, but only L. monocytogenes is consistently associated with human illness. The 13 serotypes of L. monocytogenes can cause disease, but more than 90% of human isolates belong to only three serotypes: 1/2a, 1/2b, and 4b. L. monocytogenes serotype 4b strains are responsible for 33 to 5% of sporadic human cases worldwide and for all major foodborne outbreaks in Europe and North America since the 1980s. Listeria monocytogenes was first described by E.G.D. Murray in 1924 based on six cases of sudden death in young rabbits, and published a description with his colleagues in 1926 . Murray referred to the organism as Bacterium monocytogenes before Harvey Pirie changed the genus name to Listeria in 1940. Although clinical descriptions of L. monocytogenes infection in both animals and humans were published in the 1920s, it was not recognized as a significant cause of neonatal infection, sepsis and meningitis until 1952 in East Germany. Listeriosis in adults would later be associated with patients living with compromised immune systems, such as individuals taking immunosuppressant drugs and corticosteroids for malignancies or organ transplants, and those with HIV infection. L. monocytogenes was not identified as a cause of foodborne illness until 1981, however. An outbreak of listeriosis in Halifax, Nova Scotia, involving 41 cases and 18 deaths, mostly in pregnant women and neonates, was epidemiologically linked to the consumption of coleslaw containing cabbage that had been contaminated with L. monocytogenes-contaminated sheep manure. Since then, a number of cases of foodborne listeriosis have been reported, and L. monocytogenes is now widely recognized as an important hazard in the food industry. Stages in the intracellular lifecycle of L. monocytogenes. (Center) Cartoon depicting entry, escape from a vacuole, actin nucleation, actin-based motility, and cell-to-cell spread. (Outside) Representative electron micrographs from which the cartoon was derived. LLO, PLCs, and ActA are all described in the text. The cartoon and micrographs were adapted from Tilney and Portnoy (1989). Invasive infection by L. monocytogenes causes the disease listeriosis. When the infection is not invasive, any illness as a consequence of infection is termed febrile gastroenteritis. The manifestations of listeriosis include septicemia, meningitis (or meningoencephalitis), encephalitis, corneal ulcer, pneumonia, and intrauterine or cervical infections in pregnant women, which may result in spontaneous abortion (second to third trimester) or stillbirth. Surviving neonates of fetomaternal listeriosis may suffer granulomatosis infantiseptica — pyogenic granulomas distributed over the whole body — and may suffer from physical retardation. Influenza-like symptoms, including persistent fever, usually precede the onset of the aforementioned disorders. Gastrointestinal symptoms, such as nausea, vomiting, and diarrhea, may precede more serious forms of listeriosis or may be the only symptoms expressed. Gastrointestinal symptoms were epidemiologically associated with use of antacids or cimetidine. The onset time to serious forms of listeriosis is unknown, but may range from a few days to three weeks. The onset time to gastrointestinal symptoms is unknown but probably exceeds 12 hours. An early study suggested that L. monocytogenes is unique among Gram-positive bacteria in that it might possess lipopolysaccharide, which serves as an endotoxin. Later, it was found to not be a true endotoxin. Listeria cell walls consistently contain lipoteichoic acids, in which a glycolipid moiety, such as a galactosyl-glucosyl-diglyceride, is covalently linked to the terminal phosphomonoester of the teichoic acid. This lipid region anchors the polymer chain to the cytoplasmic membrane. These lipoteichoic acids resemble the lipopolysaccharides of Gram-negative bacteria in both structure and function, being the only amphipathic polymers at the cell surface. L. monocytogenes has D-galactose residues on its surface that can attach to D-galactose receptors on the host cell walls. These host cells are generally M cells and Peyer's patches of the intestinal mucosa. Once attached to this cells, L. monocytogenes can translocate past the intestinal membrane and into the body. The infective dose of L. monocytogenes varies with the strain and with the susceptibility of the victim. From cases contracted through raw or supposedly pasteurized milk, one may safely assume that, in susceptible persons, fewer than 1,000 total organisms may cause disease. L. monocytogenes may invade the gastrointestinal epithelium. Once the bacterium enters the host's monocytes, macrophages, or polymorphonuclear leukocytes, it becomes bloodborne (septicemic) and can grow. Its presence intracellularly in phagocytic cells also permits access to the brain and probably transplacental migration to the fetus in pregnant women. The pathogenesis of L. monocytogenes centers on its ability to survive and multiply in phagocytic host cells. It seems that Listeria originally evolved to invade membranes of the intestines, as an intracellular infection, and developed a chemical mechanism to do so. This involves a bacterial protein "internalin"(InlA/InlB) which attaches to a protein on the intestinal cell membrane "cadherin" and allows the bacteria to invade the cells through a zipper mechanism. Once inside the cell, Listeria is able to escape the vacuole and enter the cytosol through the use of listeriolysin O (LLO). LLO reduces the pH inside the cell, and this acidity disrupts the vacuole membrane and creates pores, freeing the pathogen. These adhesion molecules are also to be found in two other unusually tough barriers in humans — the blood-brain barrier and the fetal–placental barrier, and this may explain the apparent affinity that Listeria has for causing meningitis and affecting babies in utero. 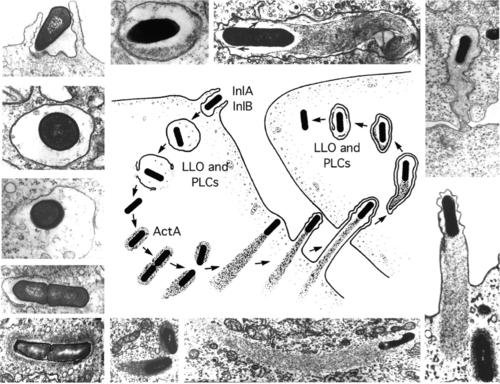 Listeria bacteria escape phagosomes formed by the host cell, allowing motility in the intracellular space. This motility in the intracellular space is due to actin assembly-inducing protein (ActA) which allows the bacteria to use the host cell's actin polymerization machinery to polymerize the cytoskeleton to give a "boost" to the bacterial cell so it can move in the cell. The same ActA mechanism also allows the bacteria to travel from cell to cell. L. monocytogenes can act as a saprophyte or a pathogen, depending on its environment. When this bacterium is present within a host organism, quorum sensing causes the up-regulation of several virulence genes. Depending on the location of the bacterium within the host organism, different activators up-regulate the virulence genes. SigB, an alternative sigma factor, up-regulates Vir genes in the intestines, whereas PrfA up-regulates gene expression when the bacterium is present in blood. Little is known about how this bacterium switches between acting as a saprophyte and a pathogen; however, several noncoding RNAs are thought to be required to induce this change. L. monocytogenes has three distinct lineages, with differing evolutionary histories and pathogenic potentials. Lineage I strains contain the majority of human clinical isolates and all human epidemic clones, but are underrepresented in animal clinical isolates. Lineage II strains are overrepresented in animal cases and underrepresented in human clinical cases, and are more prevalent in environmental and food samples. Lineage III isolates are very rare, but significantly more common in animal than human isolates. The Anton test is used in the identification of L. monocytogenes; instillation of a culture into the conjunctival sac of a rabbit or guinea pig causes severe keratoconjunctivitis within 24 hours. 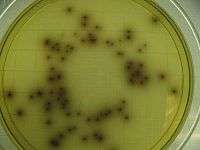 Listeria species grow on media such as Mueller-Hinton agar. Identification is enhanced if the primary cultures are done on agar containing sheep blood, because the characteristic small zone of hemolysis can be observed around and under colonies. Isolation can be enhanced if the tissue is kept at 4 °C for some days before inoculation into bacteriologic media. The organism is a facultative anaerobe and is catalase-positive and motile. Listeria produces acid, but not gas, in a variety of carbohydrates. The motility at room temperature and hemolysin production are primary findings that help differentiate listeria from coryneform bacteria. The methods for analysis of food are complex and time-consuming. The present U.S. FDA method, revised in September 1990, requires 24 and 48 hours of enrichment, followed by a variety of other tests. Total time to identification takes five to seven days, but the announcement of specific nonradiolabelled DNA probes should soon allow a simpler and faster confirmation of suspect isolates. Recombinant DNA technology may even permit two- to three-day positive analysis in the future. Currently, the FDA is collaborating in adapting its methodology to quantitate very low numbers of the organisms in foods. When listeric meningitis occurs, the overall mortality may reach 70%, from septicemia 50%, and from perinatal/neonatal infections greater than 80%. In infections during pregnancy, the mother usually survives. Reports of successful treatment with parenteral penicillin or ampicillin exist. Trimethoprim-sulfamethoxazole has been shown effective in patients allergic to penicillin. A bacteriophage, Listeria phage P100, has been proposed as food additive to control L. monocytogenes. Bacteriophage treatments have been developed by several companies. EBI Food Safety and Intralytix both have products suitable for treatment of the bacterium. The U.S. Food and Drug Administration (FDA) approved a cocktail of six bacteriophages from Intralytix, and a one-type phage product from EBI Food Safety designed to kill L. monocytogenes. Uses would potentially include spraying it on fruits and ready-to-eat meat such as sliced ham and turkey. Because L. monocytogenes is an intracellular bacterium, some studies have used this bacterium as a vector to deliver genes in vitro. Current transfection efficiency remains poor. One example of the successful use of L. monocytogenes in in vitro transfer technologies is in the delivery of gene therapies for cystic fibrosis cases. Listeria monocytogenes is being investigated as a cancer immunotherapy for several types of cancer. A live attenuated Listeria monocytogenes cancer vaccine, ADXS11-001, is under development as a possible treatment for cervical carcinoma. Researchers have found Listeria monocytogenes in at least 37 mammalian species, both domesticated and feral, as well as in at least 17 species of birds and possibly in some species of fish and shellfish. Laboratories can isolate Listeria monocytogenes from soil, silage, and other environmental sources. Listeria monocytogenes is quite hardy and resists the deleterious effects of freezing, drying, and heat remarkably well for a bacterium that does not form spores. Most Listeria monocytogenes strains are pathogenic to some degree. Listeria monocytogenes has been associated with such foods as raw milk, pasteurized fluid milk, cheeses (particularly soft-ripened varieties), ice cream (such as Blue Bell), raw vegetables, fermented raw-meat sausages, raw and cooked poultry, raw meats (of all types), and raw and smoked fish. Most bacteria can survive near freezing temperatures, but cannot absorb nutrients, grow or replicate. L. monocytogenes ability to grow at temperatures as low as 0 °C permits exponential multiplication in refrigerated foods. At refrigeration temperature, such as 4 °C, the amount of ferric iron can affect the growth of L. monocytogenes. The primary site of infection is the intestinal epithelium, where the bacteria invade nonphagocytic cells via the "zipper" mechanism. Uptake is stimulated by the binding of listerial internalins (Inl) to E-cadherin, a host cell adhesion factor, or Met (c-Met), hepatocyte growth factor. This binding activates certain Rho-GTPases, which subsequently bind and stabilize Wiskott Aldrich syndrome protein (WAsp). WAsp can then bind the Arp2/3 complex and serve as an actin nucleation point. Subsequent actin polymerization creates a "phagocytic cup", an actin-based structure normally formed around foreign materials by phagocytes prior to endocytosis. The net effect of internalin binding is to exploit the junction-forming apparatus of the host into internalizing the bacterium. L. monocytogenes can also invade phagocytic cells (e.g., macrophages), but requires only internalins for invasion of nonphagocytic cells. Following internalization, the bacterium must escape from the vacuole/phagosome before fusion with a lysosome can occur. Three main virulence factors that allow the bacterium to escape are listeriolysin O (LLO-encoded by hly) phospholipase A (encoded by plcA) and phospholipase B (plcB). Secretion of LLO and PlcA disrupts the vacuolar membrane and allows the bacterium to escape into the cytoplasm, where it may proliferate. Once in the cytoplasm, L. monocytogenes exploits host actin for the second time. ActA proteins associated with the old bacterial cell pole (being a bacillus, L. monocytogenes septates in the middle of the cell, thus has one new pole and one old pole) are capable of binding the Arp2/3 complex, thereby inducing actin nucleation at a specific area of the bacterial cell surface. Actin polymerization then propels the bacterium unidirectionally into the host cell membrane. The protrusion formed may then be internalized by a neighboring cell, forming a double-membrane vacuole from which the bacterium must escape using LLO and PlcB. This mode of direct cell-to-cell spread involves a cellular mechanism known as paracytophagy. 1 2 Ramaswamy V; Cresence VM; Rejitha JS; Lekshmi MU; Dharsana KS; Prasad SP; Vijila HM. (February 2007). "Listeria – review of epidemiology and pathogenesis." (PDF). J. Microbiol. Immunol. Infect. 40 (1): 4–13. PMID 17332901. Retrieved 2010-09-05. ↑ Gründling A.; Burrack L.S. ; Bouwer H.G.A. ; Higgins D.E. (2004). "Listeria monocytogenes regulates flagellar motility gene expression through MogR, a transcriptional repressor required for virulence". Proc. Natl. Acad. Sci. U.S.A. 101 (33): 12316–12323. Bibcode:2004PNAS..10112318G. doi:10.1073/pnas.0404924101. PMC 514476 . PMID 15302931. ↑ Genigeorgis C.; Carniciu M.; Dutulescu D.; Farver T.B. (1991). "Growth and survival of Listeria monocytogenes in market cheeses stored at 4 to 30 degrees C". J. Food Prot. 54 (9): 662–668. ↑ "Listeriosis (Listeria infection)". www.health.ny.gov. Retrieved 2015-11-16. ↑ "CDC - Sources - Listeriosis". www.cdc.gov. Retrieved 2015-11-16. ↑ Farber, J. M.; Peterkin, P. I. (September 1991). "Listeria monocytogenes, a food-borne pathogen". Microbiology and Molecular Biology Reviews. 55 (3): 476–511. PMC 372831 . PMID 1943998. ↑ Todar, K. (2008). "Listeria monocytogenes". Todar's Online Textbook of Bacteriology. Retrieved January 28, 2009. ↑ Seafood HACCP Alliance (2007). "Compendium of Fish and Fishery Product Processes, Hazards, and Controls, Chapter 15: Listeria monocytogenes". Seafood Network Information Center. Retrieved January 28, 2009. ↑ Ward, T. J.; Gorski, L.; Borucki, M. K.; Mandrell, R. E.; Hutchins, J.; Pupedis, K. (2004). "Intraspecific Phylogeny and Lineage Group Identification Based on the prfA Virulence Gene Cluster of Listeria monocytogenes". Journal of Bacteriology. 186 (15): 4994–5002. doi:10.1128/JB.186.15.4994-5002.2004. PMC 451661 . PMID 15262937. ↑ Murray E.G.D. ; Webb R.E. ; Swann M.B.R. (1926). "A disease of rabbits characterized by a large mononuclear leucocytosis, caused by a hitherto undescribed bacillus Bacterium monocytogenes (n. sp.)". J. Pathol. Bacteriol. 29: 407–439. doi:10.1002/path.1700290409. ↑ Harvey P.J.H. (1940). "Listeria: change of name for a genus of bacteria". Nature. 145 (3668): 264. Bibcode:1940Natur.145..264P. doi:10.1038/145264a0. ↑ Schlech W.F. III; Acheson, D. (2001). "Foodborne listeriosis". Clin. Infect. Dis. 31 (3): 770–775. doi:10.1086/314008. PMID 11017828. ↑ Schlech WF, Lavigne PM, Bortolussi RA, et al. (January 1983). "Epidemic listeriosis--evidence for transmission by food". N. Engl. J. Med. 308 (4): 203–6. doi:10.1056/NEJM198301273080407. PMID 6401354. ↑ Ryser, E.T., Marth, E.H. (Eds.) 1999. Listeria, Listeriosis, and Food. Safety, 2nd edn. Marcel Dekker, New York. 1 2 Gray M. L.; Killinger A. H. (1966). "Listeria monocytogenes and listeric infection". Bacteriol. Rev. 30: 309–382. ↑ Armstrong R. W.; Fung P. C. (1993). "Brainstem encephalitis (Rhombencephalitis) due to Listeria monocytogenes: case report and review". Clin. Infect. Dis. 16 (5): 689–702. doi:10.1093/clind/16.5.689. PMID 8507761. ↑ Holland S.; Alfonso E.; Heidegger D.; Mendelsohn A.; Ullman S.; Miller D. (1987). "Corneal ulcer due to Listeria monocytogenes". Cornea. 6 (2): 144–146. doi:10.1097/00003226-198706020-00008. PMID 3608514. ↑ Whitelock-Jones L.; Carswell J.; Rassmussen K. C. (1989). "Listeria pneumonia. A case report". South African Medical Journal. 75 (4): 188–189. PMID 2919343. ↑ Wexler H.; Oppenheim J. D. (1979). "Isolation, characterization, and biological properties of an endotoxin-like material from the gram-positive organism Listeria monocytogenes". Infection and Immunity. 23 (3): 845–857. PMC 414241 . PMID 110684. ↑ Fiedler, F (1988). "Biochemistry of the cell surface of Listeria strains: a locating general view". Infection. 16 Suppl 2 (S2): S92–7. doi:10.1007/BF01639729. PMID 3417357. ↑ Farber, JM; Peterkin, PI (1991). "Listeria monocytogenes, a food-borne pathogen". Microbiological Reviews. 55 (3): 476–511. PMC 372831 . PMID 1943998. ↑ Mengaud, J.; Dramsi, S.; Gouin, E.; Vazquez-Boland, J. A.; Milon, G.; Cossart, P. (1991). "Pleiotropic control of Listeria monocytogenes virulence factors by a gene that is autoregulated". Molecular Microbiology. 5 (9): 2273–83. doi:10.1111/j.1365-2958.1991.tb02158.x. PMID 1662763. ↑ Leimeister-Wachter, M.; Haffner, C; Domann, E; Goebel, W; Chakraborty, T (1990). "Identification of a gene that positively regulates expression of listeriolysin, the major virulence factor of listeria monocytogenes". Proceedings of the National Academy of Sciences. 87 (21): 8336–40. Bibcode:1990PNAS...87.8336L. doi:10.1073/pnas.87.21.8336. PMC 54950 . PMID 2122460. ↑ Garner, M. R.; Njaa, B. L.; Wiedmann, M.; Boor, K. J. (2006). "Sigma B Contributes to Listeria monocytogenes Gastrointestinal Infection but Not to Systemic Spread in the Guinea Pig Infection Model". Infection and Immunity. 74 (2): 876–86. doi:10.1128/IAI.74.2.876-886.2006. PMC 1360341 . PMID 16428730. ↑ Mandin, Pierre; Fsihi, Hafida; Dussurget, Olivier; Vergassola, Massimo; Milohanic, Eliane; Toledo-Arana, Alejandro; Lasa, Iñigo; Johansson, JöRgen; Cossart, Pascale (2005). "VirR, a response regulator critical for Listeria monocytogenes virulence". Molecular Microbiology. 57 (5): 1367–80. doi:10.1111/j.1365-2958.2005.04776.x. PMID 16102006. 1 2 3 Jeffers G. T.; Bruce J. L.; McDonough P. L.; Scarlett J.; Boor K. J.; Wiedmann M. (2001). "Comparative genetic characterization of Listeria monocytogenes isolates from human and animal listeriosis cases". Microbiology. 147 (Pt 5): 1095–1104. doi:10.1099/00221287-147-5-1095. PMID 11320113. ↑ Gray M. J.; Zadoks R. N.; Fortes E. D.; Dogan B.; Cai S.; Chen Y.; Scott V. N.; et al. (2004). "Listeria monocytogenes Isolates from Foods and Humans Form Distinct but Overlapping Populations". Applied and Environmental Microbiology. 70 (10): 5833–5841. doi:10.1128/AEM.70.10.5833-5841.2004. PMC 522108 . PMID 15466521. ↑ "Anton test - definition of Anton test in the Medical dictionary - by the Free Online Medical Dictionary, Thesaurus and Encyclopedia". Medical-dictionary.thefreedictionary.com. Retrieved 2013-08-05. ↑ "Anton's eye test". Whonamedit. Retrieved 2013-08-05. ↑ "103051F-EN-RevC" (PDF). Hologic. Retrieved 16 June 2016. 1 2 Temple, ME; Nahata, MC (May 2000). "Treatment of listeriosis.". The Annals of Pharmacotherapy. 34 (5): 656–61. doi:10.1345/aph.19315. PMID 10852095. ↑ Carlton, RM; Noordman, WH; Biswas, B; De Meester, ED; Loessner, MJ (2005). "Bacteriophage P100 for control of Listeria monocytogenes in foods: Genome sequence, bioinformatic analyses, oral toxicity study, and application". Regulatory Toxicology and Pharmacology. 43 (3): 301–12. doi:10.1016/j.yrtph.2005.08.005. PMID 16188359. ↑ Krusch, S; Domann, E; Frings, M; Zelmer, A; Diener, M; Chakraborty, T; Weiss, S (2002). "Listeria monocytogenes mediated CFTR transgene transfer to mammalian cells". The Journal of Gene Medicine. 4 (6): 655–67. doi:10.1002/jgm.313. PMID 12439857. ↑ Chu, Nina J.; Armstrong, Todd D.; Jaffee, Elizabeth M. (2015-04-01). "Nonviral oncogenic antigens and the inflammatory signals driving early cancer development as targets for cancer immunoprevention". Clinical Cancer Research. 21 (7): 1549–1557. doi:10.1158/1078-0432.CCR-14-1186. ISSN 1078-0432. PMC 4383709 . PMID 25623216. ↑ Singh, Reshma; Wallecha, Anu (2011-05-01). "Cancer immunotherapy using recombinant Listeria monocytogenes: transition from bench to clinic". Human Vaccines. 7 (5): 497–505. doi:10.4161/hv.7.5.15132. ISSN 1554-8619. PMID 21422819. ↑ Fran Lowry (2008-05-15). "Live Listeria Vaccine Proves Safe Against End-Stage Cervical Ca in Human Trial". Ob. Gyn. News. 43 (10): 2. ↑ Fleming D. W.; Cochi S. L.; MacDonald K. L.; Brondum J.; Hayes P. S.; Plikaytis B. D.; Holmes M. B.; Audurier A.; Broome C. V.; et al. (1985). "Pasteurized milk as a vehicle of infection in an outbreak of listeriosis". N. Engl. J. Med. 312 (7): 404–407. doi:10.1056/NEJM198502143120704. PMID 3918263. ↑ Dykes G. A.; Dworaczek M. (2002). "Influence of interactions between temperature, ferric ammonium citrate and glycine betaine on the growth of Listeria monocytogenes in a defined medium". Lett Appl Microbiol. 35 (6): 538–42. doi:10.1046/j.1472-765x.2002.01237.x. ↑ Schmid M. W.; Ng E. Y. W.; Lampidis R.; Emmerth M.; Walcher M.; Kreft J.; Goebel W.; et al. (2005). "Evolutionary history of the genus Listeria and its virulence genes". Systematic and Applied Microbiology. 28 (1): 1–18. doi:10.1016/j.syapm.2004.09.005. PMID 15709360. ↑ Zhang C.; Zhang M.; Ju J.; Nietfeldt J.; Wise J.; Terry P. M.; Olson M.; et al. (2003). "Genome Diversification in Phylogenetic Lineages I and II of Listeria monocytogenes: Identification of Segments Unique to Lineage II Populations". Journal of Bacteriology. 185 (18): 5573–5584. doi:10.1128/JB.185.18.5573-5584.2003. PMC 193770 . PMID 12949110. Wikimedia Commons has media related to Listeria monocytogenes.